This page lists the previews and media interviews for Super Mario Bros. from the media . A series of "Featured Articles"--which contain exceptionally thorough or useful information--are designated with an awesome Bob-Omb graphic. A wonderful article highlighting Bob Hoskins and his experience working on Super Mario Bros. There's some really good stuff in here regarding things like Hoskins' reaction to the Goombas and what he thought of filming a picture in the Southern US--his first time down there. A general overview of the upcoming film, though the second page features a wonderful quote from Beth Rubino, the set decorator, on the look they were going for with Dinohattan. An incredibly telling article published before the movie even came out. Includes detailed comments from Bob Hoskins, John Leguizamo, and Dennis Hopper as well as producer Roland Joffe and others involved in the production. An article describing the Fincannon casting team--with a great little tidbit about Super Mario Bros. This short blurb reveals that Per Gessle gives no credit to the Mario movie as inspiration for their song, "Almost Unreal." A notice for a casting call seeking an actress for the role of Daisy, including a quote from Mali Finn (the casting director) on what type of girl they're looking for. Hint: one with "spunkiness." An extended version of the above Chicago Tribune Article "Mario's Great Challenge" by the same writer. Features further stories and expanded quotes. A much better read, though certainly different enough that both warrant a read. While having additional confirmation of DeVito's initial involvement in the film is nice, that's not the best thing to come out of this article. It's the only known statement on record from Barry Morrow in regards to his draft on the film. Pretty interesting stuff. A short article in Parade featuring John Leguizamo containing some of his initial reactions working on the film. One of the very, very few interviews conducted with directors Rocky Morton and Annabel Jankel right after Super Mario Bros. was released. Get a rare glimpse into their filmmaking process and reflections on creating the film. An interview with Dennis Hopper right after shooting wrapped on Super Mario Bros. There are some pretty good comments from him about the production you won't find elsewhere. This extensive feature is one of the most revealing series of articles available from the time of production. Everything from set design to story developments are covered. Definitely a great read if you want to understand the circumstances surrounding the film's production. This first scan is of the Contents page that mentions the actual blurb found on the main link. 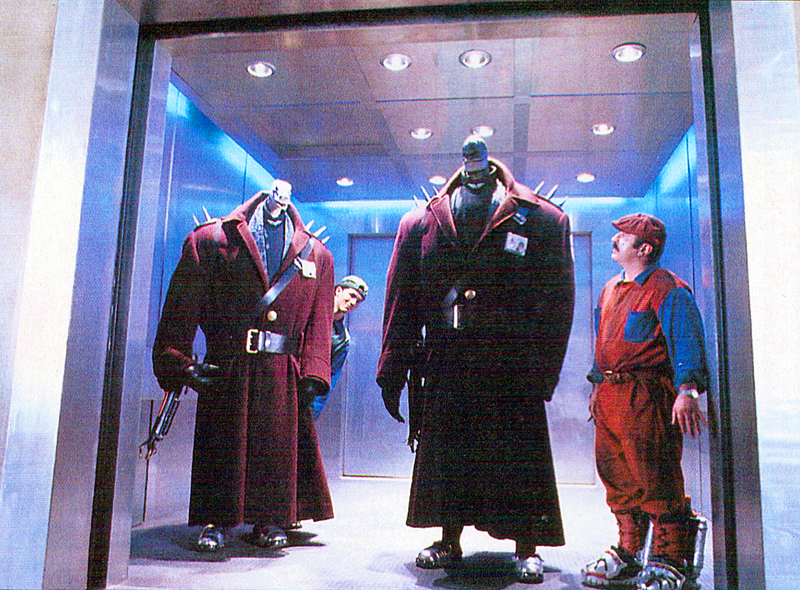 Mario Goes to the Movies. Summer CES Snapshots - a Goomba is shown at the top-right corner, and appears to be holding a Yoshi figure.."
An article written by Tyme (who worked on the film). The article details the pre-production of the movie, specifically the conversion of the cement factory into a workable set. A PDF scan of the original article can be found at the bottom of the page. This article from UK magazine N-Force is your standard preview cover story with some info on the film and some screenshots. However, there's an interesting quote concering the game elements that ended up in the film--mentioning "King Bowser" in particular. Not necessarily a reference, but the film's logo is visible on display in one of the screen shots. The movie "Who Framed Roger Rabbit" has no question mark at the end, despite popular belief. This makes this a (sic). Not sure of the exact specifics of this reference, other than it appeared in Time magazine. 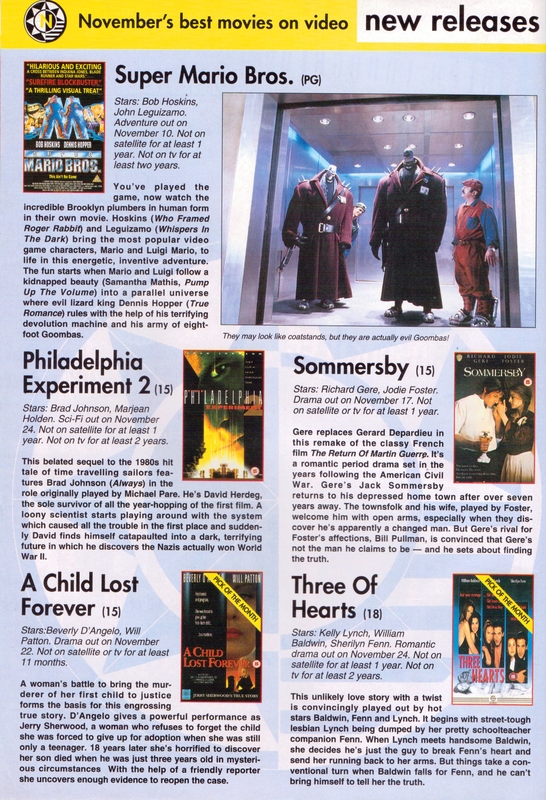 A UK Video store magazine promoting the rental release of the movie. 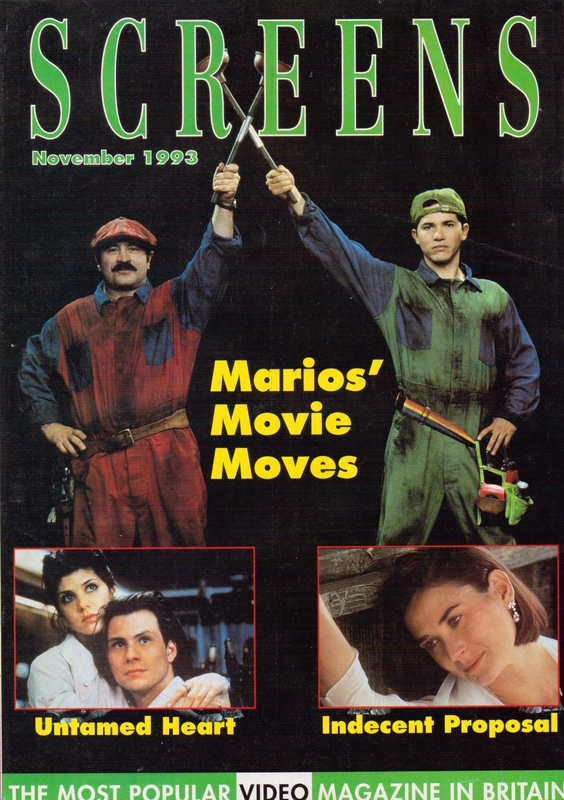 Photos include the front cover of the VHS box in an advertisement (Alongside other movies), a short write-up of the movie with a Behind-The-Scenes photos of the brothers in the lift and a hgih-resolution front page photo of the Mario Bros.